UPDATED: Occupy Los Angeles Starts Tomorrow! Unions Join Wall Street Protests! "We're getting involved because the crisis was caused by the excesses of Wall Street and the consequences have fallen hardest on workers," a spokesman for TWU Local 100 said. Community groups like Make the Road New York, the Coalition for the Homeless, the Alliance for Quality Education and Community Voices Heard are also organizing for Wednesday's action, and the labor/community coalitions United New York and Strong Economy For All are pitching in as well. The Huffington Post also has a good piece on the growing union support for Occupy Wall St.
UPDATE 2:38PM PST: In the face of the LAPD's apparent refusal to make a legal place for the occupation, a number of people from Occupy Los Angeles have been in contact with members of the city council in an effort to remove barriers to a peaceful protests. It was raised at the city council meeting earlier today and as I write this we are awaiting the outcome of an inter-Departmental meeting between the LAPD, General Services and the City Attorney's office to see what accommodation the City of Los Angeles will make for its citizens. Much earlier today Sarah Brennan from Councilmember Richard Alarcon's office called me asking how the Councilmember could show his support. 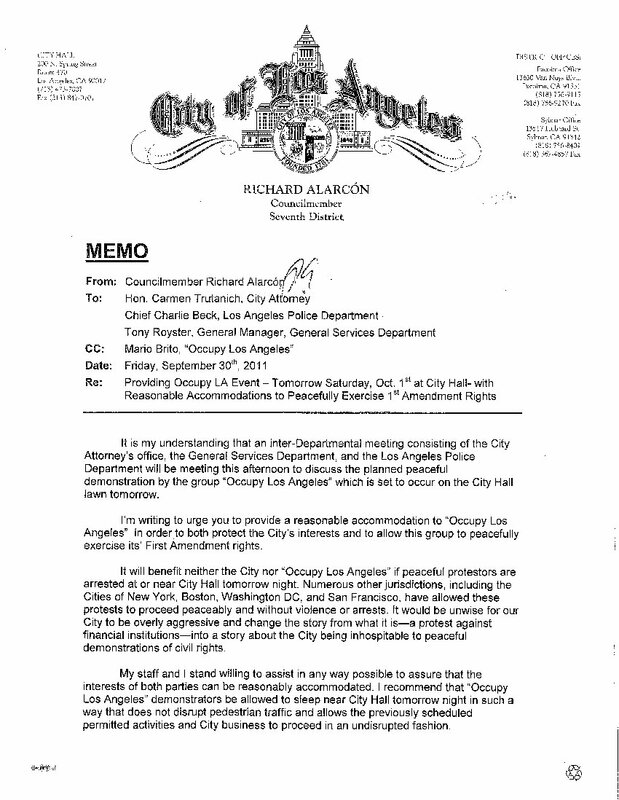 I said the best thing he could do now would be to help us secure the legal right to peacefully protest at city hall. 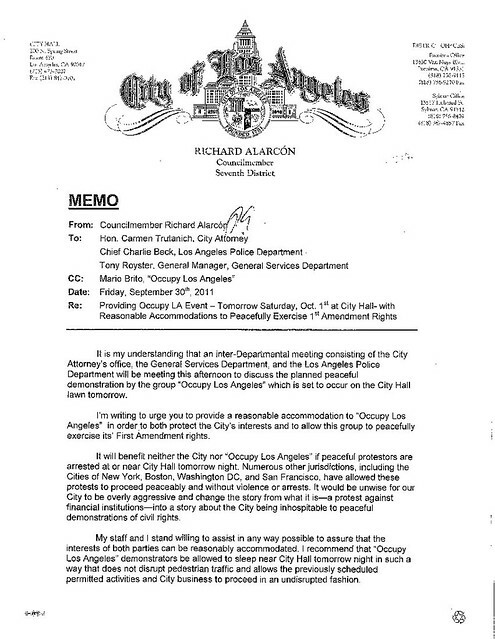 I have just received a copy of the letter below which makes me very happy and frankly, it's not often that I am happy with a Los Angeles City Councilmember. However, we await the outcome of the meeting. Check back for more stuff later.